This Arca-Type Quick-Release Plate from Acratech is compatible with the Leica M and with most Arca-Swiss compatible release clamps. It's machined in the USA from 6061 T-6 aluminum and it features an anti-twist lip that prevents rotation. 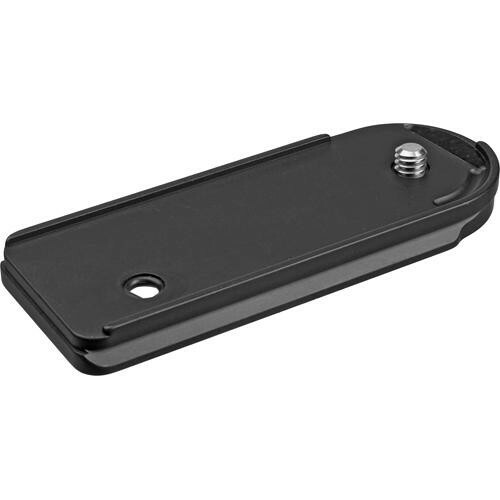 Box Dimensions (LxWxH) 5.5 x 3.0 x 1.0"
Arca-Type Quick Release Plate for Leica M is rated 5.0 out of 5 by 3. Rated 5 out of 5 by Anonymous from Exactly what I needed It's a simple Arca plate that does the job. I recently bought a tripod/head combo from Induro (highly recommend as well) that is for Arca and it came with one universal plate which is nice but I wanted something that I could put on my M3 and leave it if I wanted to and still have that universal plate for my Rollei or 4x5 kit. I like that the Acratech piece has a lip on it so it won't rotate or anything either once it's installed and it you can leave it on permanently if you want because it still leaves easy access to removing the entire bottom plate. I'm not sure that I'll leave it on all the time yet or not but it's about as low profile as you can make one of these. Overall it's a great product and Acratech is a great manufacturer that I'll be buying from again when I can save for their GV2 ballhead. Rated 5 out of 5 by Alfred J. from Thank Acratech! I needed a base plate for my Leica MA 127 and ordered this product. It fits perfectly on the camera and works with my Acratech ballhead. The length of the plate extends to about 75% of the bottom of the camera so the Leica's bottom plate turn dial can be turned to load and unload film. However, I have not tried this yet since I had film in the camera already loaded when I mounted the plate. It doesn't add to the size of the camera significantly and I can still slide it into my Domke F-803 bag as it did before the plate was attached. You can set the camera on the table and sits flat as it should without toppling over. I leave the plate on the whole time since I do use a tripod often with my camera. Note: the plate is only for horizontal use only so you have to move your tripod head vertically for vertical shots. Rated 5 out of 5 by Vincent from A handy accessory. The plate fits my Leica M7 and an Arca-type clamp perfectly. It lacks a thread for tripod, which is not a problem if you always use a clamp on the tripod head. Will this one fit with the M10? I understand the M10 is a little slimmer. If the camera is slimmer, it might not work. You can tell from the photo that this is a very form fitting plate. Leica was pretty good about keeping this same bottom configuration for as long as they have. Not sure why they made it thinner when it appears to be almost the same as the previous models. Will this plate work with the Leica MA Type 127? I like your confirmation if this will work with Leica M type 240? Yes, it will fit on the Leica M 240. Will this fit the Leica M262? No because the hole on this plate is offset and the mounting hole on the M262 is in the center.Take a look at Acratech part number 2137. Will this work with a leica M6? Our Leica Plate #2148 will fit the M series body including the M6.